Tim Cook takes the stage at Apple Town Hall, carrying a guitar. After going over company news, profits, iOS8 adoption rates, etc. he proceeds to smash said guitar on the stage, “The Who”-style. “This is what you all felt like last year when we released GarageBand 10, didn’t you?” He exits the stage. Lights go black. A low bass rumble. Video starts playing – first a globe. The globe zooms out into a watch face. It is the Apple Watch. A guitar icon shows on the watch. GarageBand 11 for Apple Watch. WatchBand. Craig Federighi on stage: “We felt that we really screwed up with GarageBand 10. 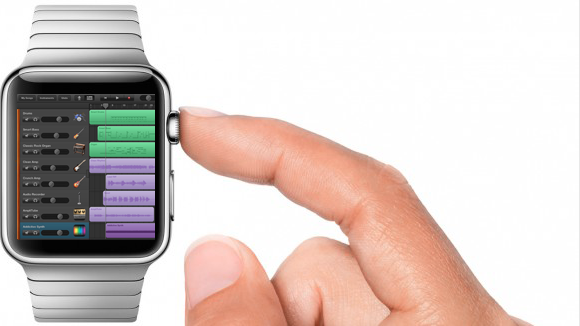 To make up for this, everyone who downloaded GarageBand 10 gets a free Apple Watch, preloaded with WatchBand. WatchBand demo: no controls, no timelines, no UI. Just press the icon and start air-guitarring, Bill & Ted-style. A song will appear in your iCloud, pre-quantized and mixed. Brief Q&A session. No questions. None of the musicians and educators who built their curriculum on GarageBand 9 and earlier are present to ask questions. The tech press who has no idea what’s going on thinks these are all great ideas. Apple proceeds to release a ton of cool hardware, all running the new WATCHBand app. The new Mac Pro can “shake out” 12000 songs per second, all while avoiding confusing things like Track Effects and things like low latency recording. End of year-long nightmare keynote. WILL KUHN Blog at WordPress.com.